Christmas apps: the best ones to have even more fun this year! The most wonderful time of the year has almost arrived. Christmas carols are played in shopping malls, gifts are being purchased and the popularity of Christmas apps are rising. Whether you’re a fan of this national holiday or a mobile application enthusiast, keep reading this article to find out what the must-have applications are for Christmas 2017. 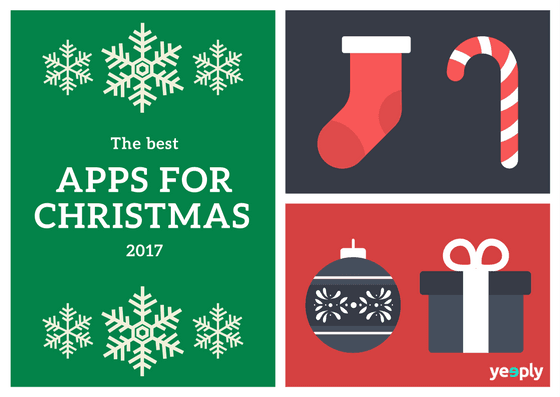 We, at Yeeply, created a list of Christmas apps we like the most that will help you to get in the holiday mood. 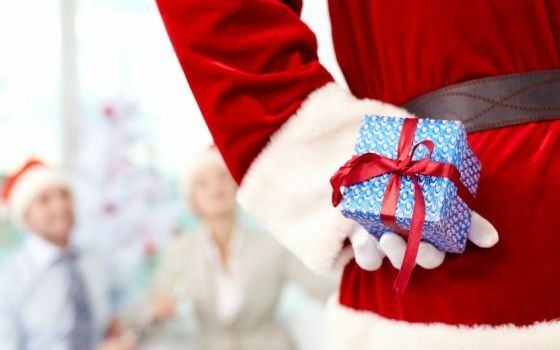 One of the most popular activities during Christmas time is the well-known: secret santa. This is a traditional gift exchange game, played in many countries around the world. Everyone loves to receive presents but no one likes to organise secret santa when you have to keep track of all the friends, family, colleagues or classmates that are participating. However, it’s still necessary because how sad would it be if one person didn’t receive a gift because it wasn’t well organised? But don’t worry, with the Secret Santa App for Android or the Secret Santa Generator for iOS, it’s possible to make sure everyone from your beloved ones is going to receive a present. Last but not least, press the send button and the app will automatically assign a Secret Santa to everyone by email. Christmas is probably one of the most popular times of the year when people are buying present for others (and sometimes oneself). Sometimes we come up with an original idea for a present, but if we don’t write it down at that moment, it’s most likely you will forget it. To help you with this and keep track of all the Christmas gifts you would like to buy, there are applications to help you out with this. Christmas Gift List for Android and The Christmas List for iOS are both easy-to-use apps to help you organise your wish lists and budget. You can keep track of the process by changing the status of a gift from “to buy” to purchased, shipping, received and wrapped for example. It is also possible to create shopping lists by store and you could even choose to print them. In addition, the apps include a countdown until Christmas to let you know how many days you have left to complete your shopping plans. Not everyone can be a pro at decorating Christmas tree’s and make them look like they are part of the Christmas decoration at Harrods. In case you need a creativity boost for decorating your Christmas tree, this app might be something for you! The Perfect Christmas Tree for iOS and Android works like a calculator that determines the exact number of balls and lights that are needed and can even indicate how big the angel or star on top of the tree should be. These calculations are based on the size of the tree and useful for large trees that are used to decorate public roads or large shopping malls. Although, the app has been created for domestic use in the first place, so are you ready to get a perfect Christmas tree? You think sending Christmas cards is a little old-fashioned? Try to send a digital one that allows you to “elf” yourself in a series of customised videos where your face is appearing on dancing elves! ElfYourself is available for iOS and Android and very easy-to-use. Just upload up to five photos of friends for example, select a dance, and the app will automatically create your personal Elf Yourself video. It’s not only funny to create but even greater to share it with friends, family or colleagues. Serving original starters, preparing side dishes and creating a perfect dessert while roasting the turkey and not letting it burn in the oven. Cooking an impressive Christmas dinner for your family is sometimes harder than you think… But who knows? Maybe this year it’s your turn to shine in the kitchen during the Christmas holidays. With a little help from the right app, you don’t need to be a chef to serve a great meal. You just have to follow the instructions and the rest will follow. The Best Christmas Recipes Collection app for iOS and Christmas Recipes for Android, provide you with enough mouth-watering and delightful recipes that are easy to make. Just make sure you don’t wait until the last moment to do your necessary groceries. Purchase, cook and impress! For the little ones it can sometimes be boring to be stuck at home and wait until they can open the gifts. That’s where the smartphones and tablets of parents are coming in. Download these Christmas apps to keep your kid entertained during a day at home. 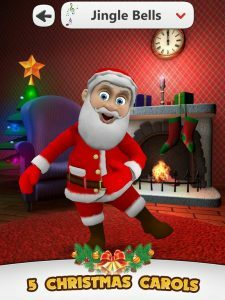 The app Santa Claus- Christmas Game for iOS, enables you to listen to christmas carols, talk to santa and play mini games like: Flappy Santa, Food Drop, Santa Jump and Santa vs. Snowman. Another popular app is the Granny Subway Run: Christmas, available for Android. In this game, you have to help Santa reach the town to deliver the Christmas gifts. Along the way, Santa will have to pass many obstacles and try to collect as many coins as possible. We hope these Christmas apps will contribute to enjoy “the most wonderful time of the year” even more. Merry Christmas!